If you are good with your hands, have a technical aptitude and are willing to learn, this would be an excellent opportunity for a career with an exceptional local company! 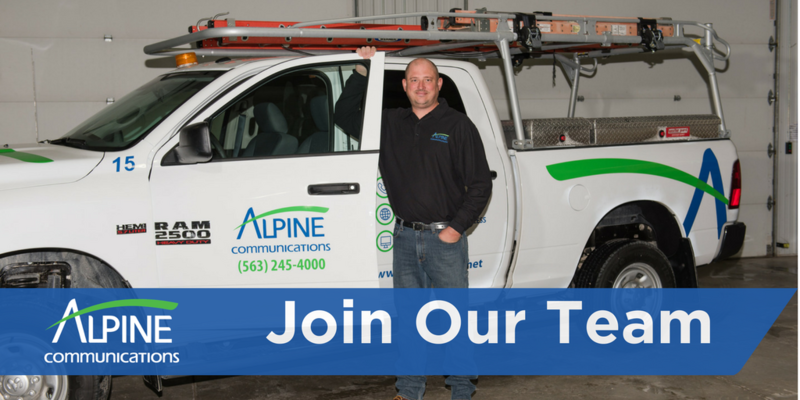 As a technician with Alpine Communications, you’ll bring customers face-to-face with the latest communications technology (voice, internet, CATV, home monitoring service) by providing installation, repair, and maintenance of communications equipment and systems. How cool is that? You will also learn to test repaired, newly installed or updated equipment including switching and network equipment to ensure that it functions properly and conforms to specifications. This position will evolve over time, and we’ll want you to evolve with it! We don’t just hire anyone. In fact, we’re highly selective; committed to hiring only those technicians that have an eagerness and willingness to learn and keep learning, possess an unwavering reliability and strong work ethic, and a desire to provide or community top-notch customer service. In addition to full-time work, top pay, and professional training and development opportunities, we provide a benefits package that is among the best in the area. Our comprehensive benefits encourage our employees and their families to build a lifelong relationship with us.